November 14th 2015 was World Diabetes Day, and marks the twenty fourth year both the International Diabetes Foundation and World Health Organization dedicated to spread global awareness about diabetes, treatment options, and most importantly – how it can be prevented. There are two types of diabetes: Diabetes I is due to genetics, but Diabetes II is linked to the lifestyle of the individual, and is preventable. 9 out of 10 diabetes II cases could have been evaded by a healthier lifestyle in regards to diet and exercise. According to World Bank data, nearly 70% of Kuwaiti men are obese, along with 80% of Kuwaiti women. Kuwait now ranks 6th in the world of adults diagnosed with diabetes II. Diabetes II is called adult-onset diabetes because it is usually diagnosed in people in their 30’s. However, the number of children developing it has increased drastically due to childhood obesity. Harvard School of Public Health has concluded that there is sufficient evidence to link the consumption of soft drinks to the uprising of diabetes, which is what motivated Elevation Burger cut it out of the menu. All around the globe, there were blue circles placed everywhere unified in honor of World Diabetes Day, and we were proud to have them on all of our storefronts. But we decided to take it one step further. On this day, all eight Elevation Burger stores, including our station at Nuqat, stopped selling soft drinks to our guests. In order to make an impact, we served them a free water bottle instead, which included a small but eye opening message. Sounds like a small step, right? 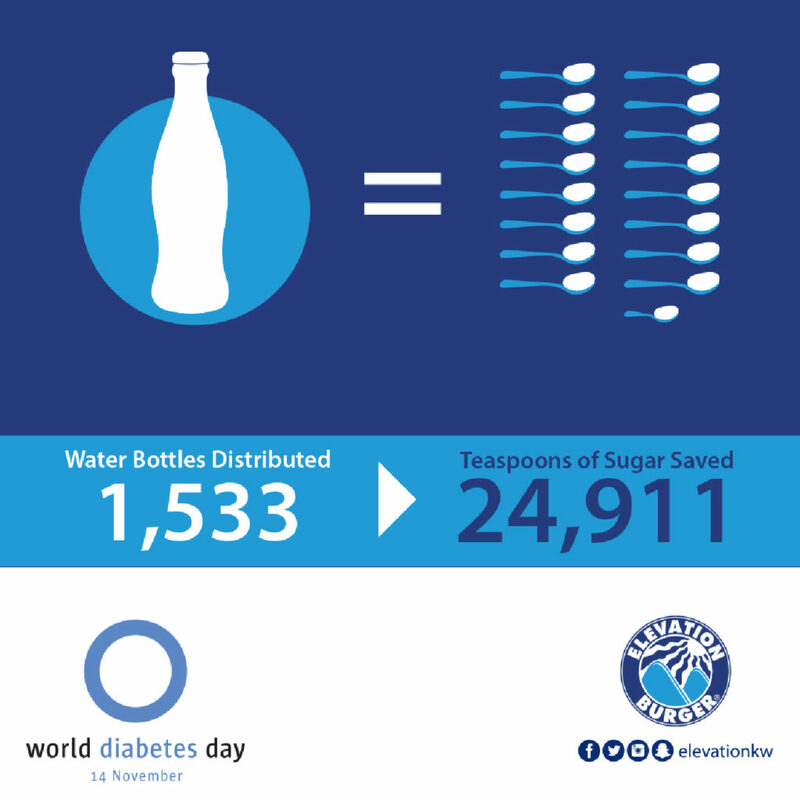 In one day, we replaced 1,533 soft drink orders with water. This is the equivalent of 24,911 teaspoons of sugar, and 373,665 empty calories. Those numbers are not small, they are the core of our message: What would happen if more people started making this choice for themselves?